Dads and kids should be aware that this is very much a LEGO game. The game board itself is made up of a couple hundred little pieces, and you have to build the board before you play your first game. This is not noted on the box, however, so don’t get yourself into a trap where you’ve devoted an hour to game play and eat up most of the time in construction. With three pairs of experienced LEGO-building hands, it took us 30 minutes to build the board before we could play a game. Unfortunately, this is where the fun of the evening was put on PAUSE as we tried to decipher the directions. These are unquestionably the worst directions I’ve ever seen and are mostly incomplete. It’s as if, after having come up with a really interesting game concept and LEGO integration, the producers just got bored with the instructions and quit half-way through. They finally cop out by saying, “invent your own rules.” That’s right. The makers were so unsure of how the game should be played, they suggest you figure it out yourself. Luckily, through the magic of the Internet, a frustrated dad is not alone. I found many people who had worked through this and chronicled their anger online. The best one I found was this article on LEGO Hogwarts directions. Once we had at least an idea of what we were doing, we were able to play a game and figure out how the game is “probably” supposed to be played. Once you have the basic idea, game play was pretty straightforward and my six year-old was able to figure out what to do and, of course, eventually beat his older sister and myself. And then, the ideas they provide for making your own rules and changing the game (the die can actually be altered for example) finally made sense and are very good wrinkles. Dads should know that, along with 200+ pieces used to build the game board, there are about 25 more little pieces that are loose and intrinsic to gameplay. I don’t know if I’m a basically hyper, easily excitable person, but playing a $30 game that can be rendered useless if a little boy loses a piece, does not bring out the best in me. I got a small baggie and became super-vigilant on LEGO piece inventory control. audit, and accounting. It was not pretty. Despite it’s issues, we’d recommend this game for dads and kids. 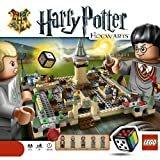 LEGO Harry Potter inventively uses a Hogwarts School feature (the moving, changing staircases) as a strong strategic element, along with plot devices like the Marauders Map and Mrs. Norris, the cat. We had a fun time as a family, and none of us felt left out or bored. Additionally, while the roll of the die brings chance into the mix, players need to think at least a few moves ahead, which makes this game more thoughtful than many games that can be played by younger kids. LEGO Hogwarts is $30 at Amazon. Pros: 1. Fast play.2. Dads and kids love LEGOs. Everyone will enjoy the anticipation of opening the box.3. Good value with both a construction project and a game.4. Strategic play not alway seen in a game that can be played for kids six and up. Cons:1. Really bad instructions. Dads should research and understand rules before opening the box so they don’t scream at kids who will surely get impatient waiting.2. Lots of little pieces. I’m sure I’m not the only one who worries about losing all the pieces to a hyper-active vacuum or clean-up spouse.